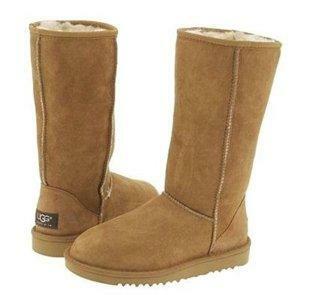 UGG boots banned in school. Education crisis solved! Say what you will about UGG Boots (warm, fuzzy, cruel, unflattering, so 2003, etc. ), they're not the biggest problem in education today. But a Pennsylvania middle school wants them off students' feet and out of the classroom for good. As of Monday, students of Pottstown Middle School will be barred from wearing the fur-lined boots in classes, reports the Delaware County Daily Times. This past Wednesday, Pottstown Middle School principal Gail Cooper sent a note home to parents stating "following several problems with these items, I have banned the outdoor, open top boots from our classrooms." Those "problems"? Cell phone contraband, hidden in the cozy space between the ankle and boot. School policy states students are allowed to bring their phones to school but they have to be turned off and kept in their lockers during classroom time. All that roomy fur has become the perfect place to smuggle handheld technology into the classroom. The new school policy states: "Students may continue to wear outdoor boots to and from school to protect them from cold, snow and ice but need to change into a pair of sneakers or shoes before entering homeroom." It's a sad day for people who dress like Chelsea from Teen Mom 2,but a triumph for Goths, '90s revivalists and skaters. Under the new ordinance: "lace up, tight at the ankle, boots, shoes and high top sneakers," are totally acceptable. Expect a few extra members in the middle school Oi! punk appreciation club and the distant "bah" of relief from an Australian baby lamb. But parents -- sick of school clothing bans -- aren't nearly as grateful for the new policy. In recent months, schools around the country have outlawed baggy pants, skinny jeans, dyed hair, colorful makeup, short skirts, scoop neck tops and the list goes on. Administrators' focus on student fashion isn't just a confounding approach to serious holes in education, it's becoming a frustrating financial burden for parents. beneath the reported story . "When the schools started paying to raise and clothe my children then maybe...maybe they can have a say in dictating my child's wardrobe." Another parent, among the hundreds commenting on The Mercury's page, called for a student push-back: "I told my kids that they should start a petition. I mean it's bad enough they already wear uniforms and now they want to tell them what shoes they can wear. I could see if it was flip flops, but boots?" One parent finds the ban discriminatory towards girls: "I'm assuming this is applying to mostly girls since I rarely see any boys wearing Uggs.... Pockets, bras, socks, what's next?? I think this is absurd!" Meanwhile, one pupil makes the most convincing case for reversing the ban: It won't work. "Most girls hide [cell phones] in there bra, or their waist band, it's ineffective they will just keep finding other places," writes the local student. "Plus my phone fits in my sneaker." Let's not give schools anymore ideas.